This fixture is beautiful. The picture doesn’t do it justice. I’m really happy with this purchase. I have gotten compliments from visitors. It looks more expensive than it really is. The champagne crystals sparkle in the light!!!! 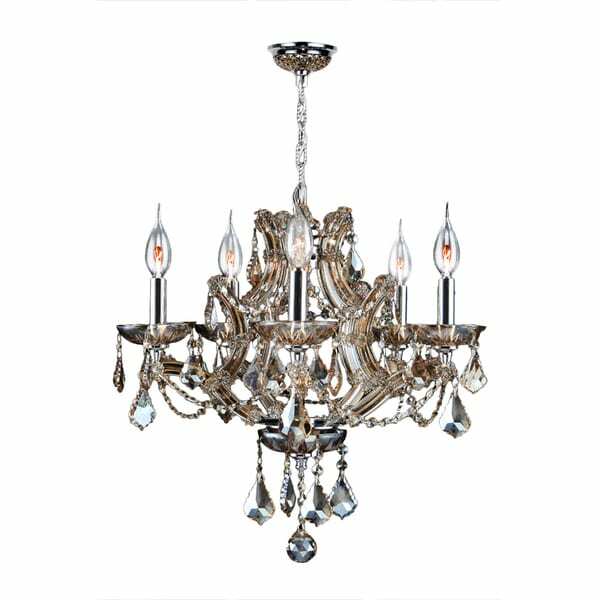 Maria Theresa Collection 5 Light Chrome Finish and Amber Crystal Chandelier 19" x 18"
This stunning 5-light Crystal Chandelier only uses the best quality material and workmanship ensuring a beautiful heirloom quality piece. Featuring a radiant chrome finish and finely cut premium grade golden teak colored crystals with a lead content of 30-percent, this elegant chandelier will give any room sparkle and glamour. This fixture does need to be hardwired. Professional installation is recommended. Dimensions 19.0 In. X 19.0 In. X 18.0 In. "Hi, are the crystals at the bottom a grayish color? Also, do you know the color of the chain and ceiling piece? I can't quite tell from the picture. Thank you!" Maria Theresa Collection 6 Light Chrome Finish and Golden Teak Crystal Chandelier 20" x 19"
Maria Theresa Collection 4 Light Chrome Finish and Golden Teak Crystal Chandelier 19" x 18"